Place everything EXCEPT the kale into the blender and quickly blend to mix the ingredients and chop the walnuts into tiny pieces. Place kale pieces into a large bowl. Pour blended mixture over the kale and massage it in. 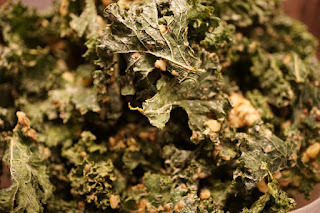 Place coated kale pieces on dehydrator trays covered with parchment paper or silicone mats (made for the dehydrator). For the first hour, set your dehydrator to 135 degrees. Then, reduce the temperature to 115 degrees and dehydrate until crispy. 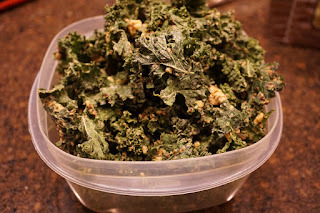 How is vthe best way to store kale chips? In an airtight container. Enjoy!